We'd love for you to talk about video games right here. Notice that the art is different today? The artist for the work we originally chose to feature for the month of September in TAY does not want his work used. Fair enough. 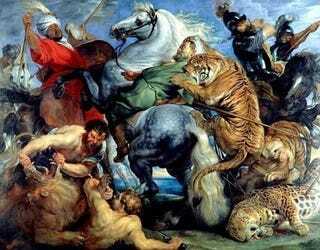 We'll use Peter Paul Rubens' ''La chasse au tigre, au lion et au léopard'' (Hunting The Tiger, Lion and Leopard), which was submitted by reader 8thR. Submit your variation on the work at #TAYpics. Apologies for the change in direction, but this new painting is just as wonderful as the last one, so we all win.